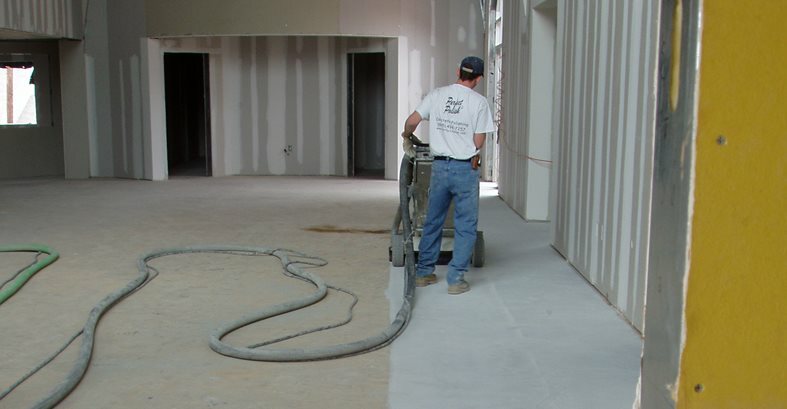 Tips and insights on choosing the right type of diamond tooling for polishing concrete floors By Bob Harris, The Decorative Concrete Institute, Temple, Ga. When armed with the right diamond tooling and equipment, you’ll be ready to attack the floor. To do the job right, you will need multiple sets of diamonds with varying degrees of bond for different concrete hardnesses. This double-segment diamond tool has an easy-change plate for quick changing of the diamonds. When you use the correct diamond relative to the hardness of the concrete, you will cut and polish more efficiently. 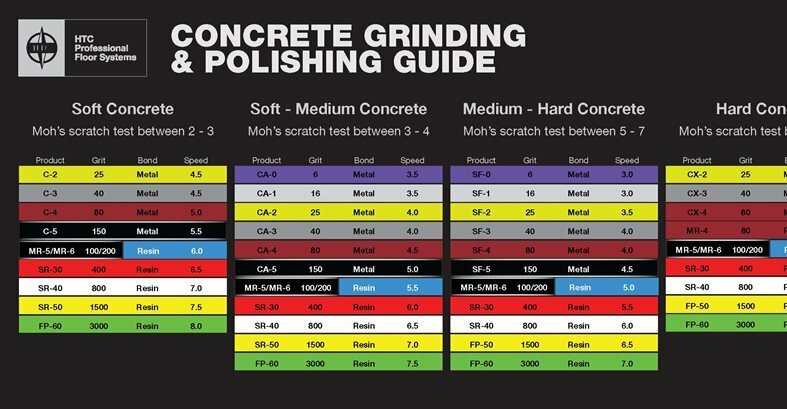 This grinding chart helps contractors choose the proper diamonds for polishing soft, medium or hard concrete. For years, concrete floors were considered utilitarian and functional at best, with no perceived aesthetic value. How ironic that polished concrete today is one of the most sought-after flooring alternatives in many different market sectors, including heavy and light commercial, tenant improvement, and residential to name a few. Just last month, we flew to Arkansas to consult on a high-end polished concrete floor, and when we got off the plane at the local airport, most of the floors were beautifully polished concrete, which is a testament to where this finish is being accepted and used. Clients choose polished concrete surfaces for a variety of reasons, including the unique stone-like appearance, high light reflectivity, and the huge reduction in annual maintenance costs. What’s more, polished concrete is an environmentally responsible system that lends itself to LEED projects. 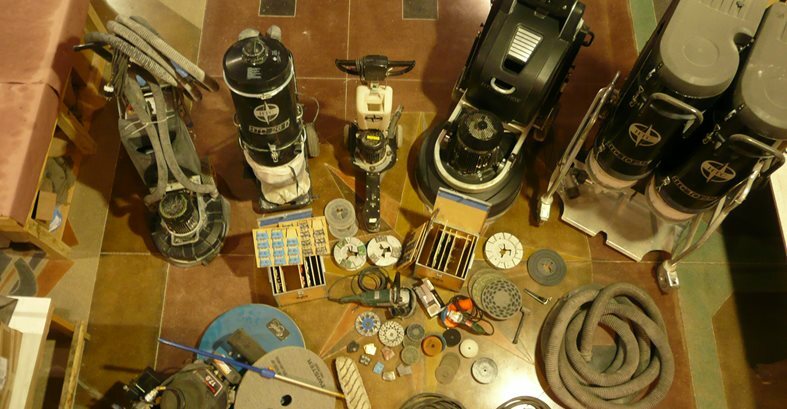 Although the grinding equipment is an important part of the puzzle to producing these one-of-a-kind floors, the true workhorse is the diamond tooling. Learning how to successfully polish concrete starts with having an understanding of using the appropriate grit and type of diamond tooling relative to the substrate you are working on as well as the desired effect you want to achieve, such as coarse-aggregate exposure, a sand finish or a cream finish. It is your responsibility as the contractor to understand what role the diamond tool plays in the process. Unfortunately, the popular maxim “diamonds are forever” is not the case in the industry of grinding, honing and polishing concrete and cement-based toppings. I’m reminded of a story of a local contractor calling me crying the blues about how fast his diamonds were wearing out and that he was not getting any support from his supplier. It was determined that he was using a soft-bonded diamond on extremely soft concrete (we’ll get to why that’s a problem later). The result was that he was getting less than 1,500 square feet of use per set of diamonds when he should have been getting roughly 7,000 to 10,000 square feet per set with the appropriate bond. Talk about lack of productivity! Expert InsightsTo get expert insights on diamond tooling, I interviewed John Abrahamson, national sales and marketing manager for SASE Company, a manufacturer of grinding equipment and diamond tooling, and Carlos Perez, owner of Custom Concrete Specialists, Miami, which does some extremely high-end concrete polishing work. Buy: Concrete Polishing Accessories here. It’s mind boggling to see how the polishing industry has evolved through the years, especially when it comes to advancements in diamond tooling. Just when you think you have perfected a certain sequence with a certain type of diamond tooling, along comes a later and greater version that cuts faster and polishes to a higher degree of shine. Yet despite these advancements, the essence of how diamond tooling works its magic hasn’t changed. Here are the basics you need to know to get the most productivity from your diamond tooling, along with some insights from industry experts on how to achieve the best results with today’s systems. Diamond Bond Basics The term bond refers to the matrix in which the small chips of diamonds are suspended. For example, metal bond refers to a metal matrix and resin bond refers to a resin matrix that suspends the diamond chips. Although this is a very basic analogy, think of a chocolate chip cookie, with the chips being the diamonds bound together with the cookie dough. To achieve the greatest productivity, the diamonds always need to be exposed so they do what they are supposed to do, which is cut or polish the concrete surface. That means that on hard concrete, a soft-bonded diamond needs to be used, whereas on soft concrete a hard-bonded diamond needs to be used. Another important term used in diamond tooling is the segment, or the raised part of the tool that holds the metal or resin bond. There are a variety of different tools with varying amounts of segments. Often you will hear the term “single seg” or “double seg,” which refers to how many segments are mounted on each tool. More segments on the mounting plate means less head pressure, whereas if you use only a single segment, all of the head pressure is on that one segment. 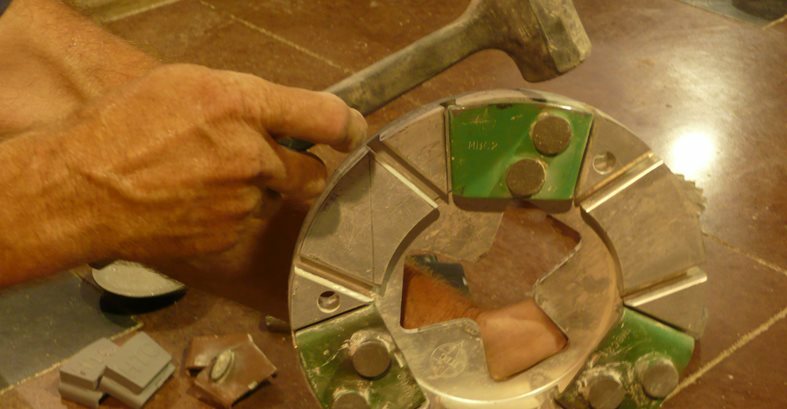 Early on in the polishing industry, diamond tooling only consisted of metal bond and resin bond. In today’s market, the list now includes hybrid or mixed-resin diamonds, which are usually a blend of both resin and metal bonds within the same segment, and PCDs, which are polycrystalline scrapers commonly used to remove coatings and mastics. Another important factor when choosing the proper tooling is understanding how hard or soft the concrete is. Knowing whether you are working on soft, medium or hard concrete enables you to purchase the correct bond of the tools and dramatically increase productivity. Some manufacturers have grinding guideline charts to help contractors find the corresponding type and bond of the diamond needed for the particular hardness of the concrete. One way to determine the hardness of the substrate is to conduct a Moh’s hardness scratch test. The Moh’s scale ranks the hardness of minerals on a scale of 1 to 10, with 1 being the softest and 10 being the hardest. Concrete usually falls somewhere between 4 and 8 on the Moh’s scale. To further complicate the selection process, diamond tooling is available in various grits, which refers to the size of the diamonds within that tool. The lower the number of grit, the larger the size of the diamond. Conversely, the higher the number, such as 800, 1500, or 3000, the smaller or finer the grit. Unfortunately, when it comes to the proper sequencing of diamond tooling, you can’t take a one-size-fits-all approach. Finding the right diamond combination relative to the actual concrete you are working on is the key to achieving maximum productivity.